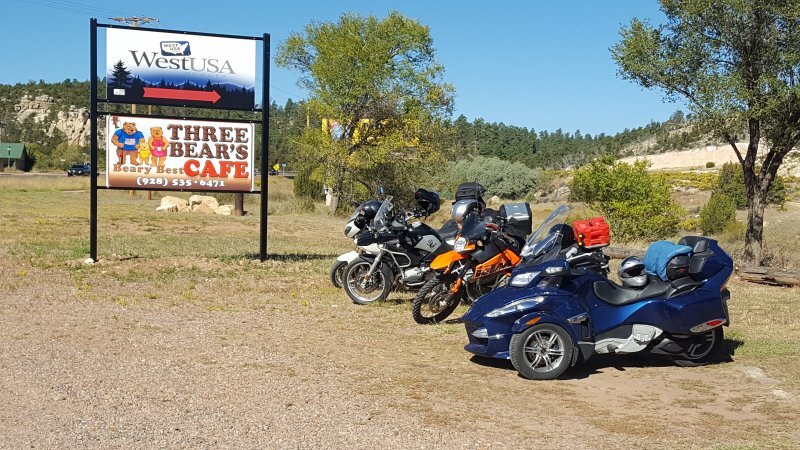 Before heading to Scottsdale the next morning we ate breakfast at Three Bears Cafe in Heber. The waitress who served us was a character with a sense of humor. 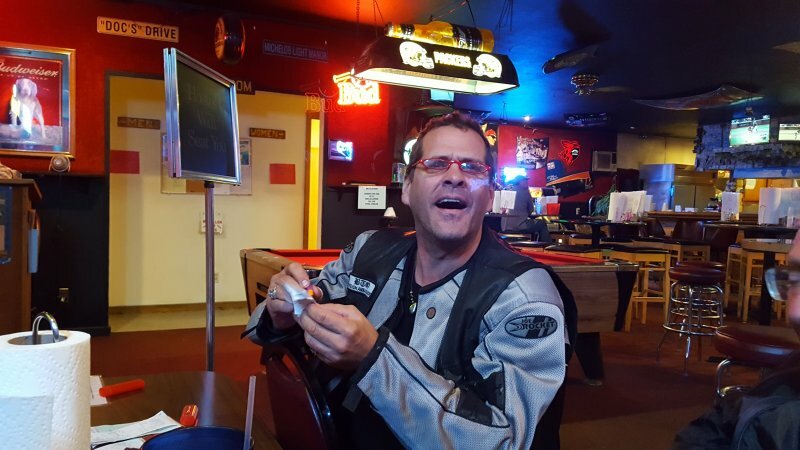 In response to her, “Anything else,” after taking our order I said, “I could go for some water.” She asked, “Where will you go with it?” I was initially baffled by her response, until everyone else began laughing. She kept us entertained through the entire meal. The food was good too. After breakfast we headed to Scottsdale through Salt River Canyon on US-60. The road through Salt River Canyon is fun with lots of short sweepers and twisties. 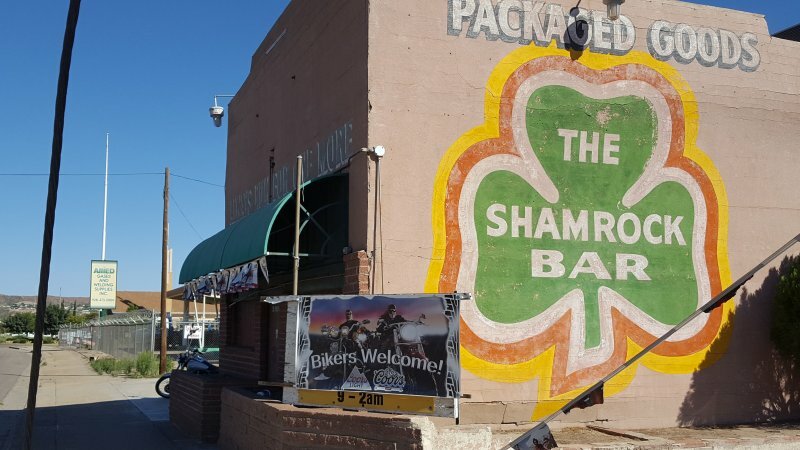 Following the canyon we stopped at the Shamrock Tavern in Miami, just west of Globe, AZ. The tavern has been a traditional stop which we’ve manged to observe on each visit with Andy and Cayla. The roads from Miami to Scottsdale are a slog. US-60 and the interstates are largely flat and straight. There was a pay off though: A visit to the place I was first introduced to the Hatch Chili: Aho Al’s. After unpacking and getting settled at Andy and Cayla’s we rode in Andy’s truck to Aho Al’s in Scottsdale. All the food was excellent, but the Chili Con Queso is as addicting as I remembered. It has just the right amount of heat with a full hatch chili in the queso. Thank you Andy and Cayla (and Don and Judy) for a good time in Arizona. After visiting the Classical Gas Museum in Embudo, NM we continued our two day ride to Heber via White Rock, NM on NM-68/502/4. We largely followed the Rio Grande River. We would visit Bandelier National Monument, Sante Fe’s Palace of the Governors, the NROA Very Large Array near Socorro, NM and Pie Town, NM. 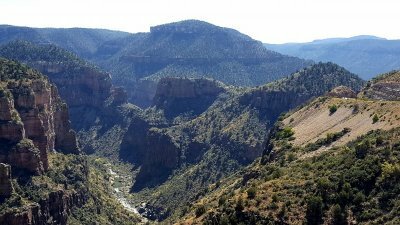 Hike the .5 mile first half of the main loop to see Big Kiva, Tyuonyi ruins (once a two story structure with 400 rooms largely used for storing food), Cliff Dwellings and Long House (built along the base of a cliff and could be four stories tall with lots of petroglyphs). Hike the .5 mile path to the Alcove House. The Alcove House is reached via 4 ladders which scale 140 feet up the cliffs. I’m a bit acrophobic so was a little nervous about it. Steve read from the Official Bandelier guide book as we walked the first half of the loop trail. It was a good refresher for us. 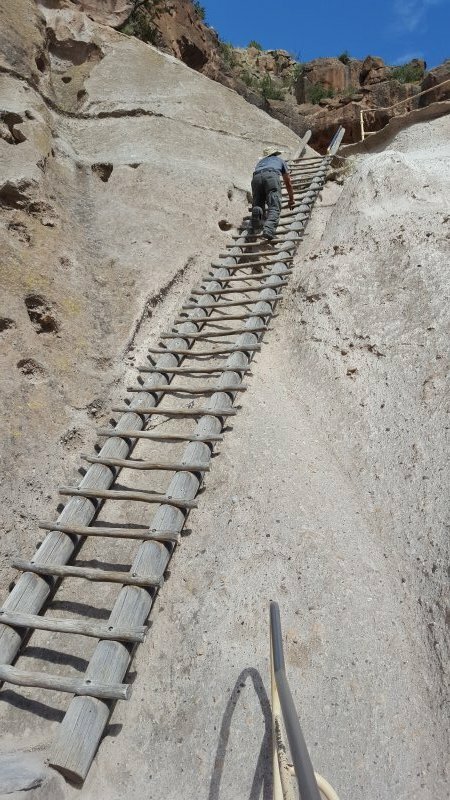 Once we got to the base of the Alcove House we discovered that the ladders were solid and well built so scaling them was fairly easy. It was a good feeling getting to the top where we discovered a breathtaking view and a bit of its history. The Alcove House (aka Ceremonial Cave) was discovered in 1908 and reconstructed in 1910. 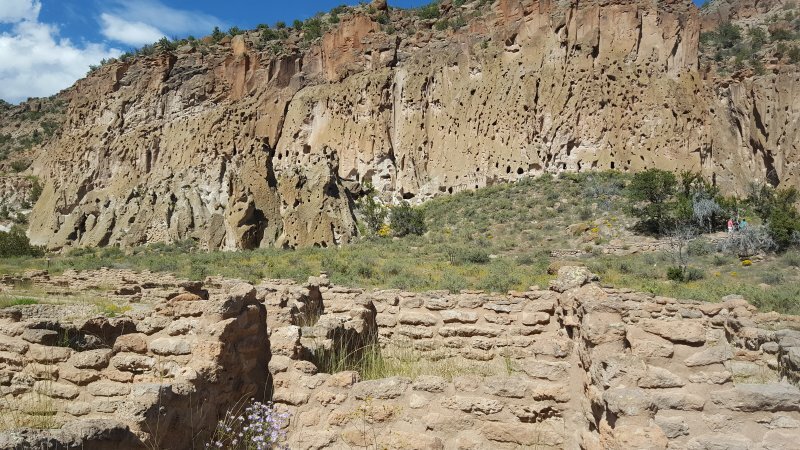 It was used by puebloan people in the Frijoles Canyon from approximately 1150-1600, housing up to 25 families. After the Alcove house we hiked the .5 miles back to the main loop trail. 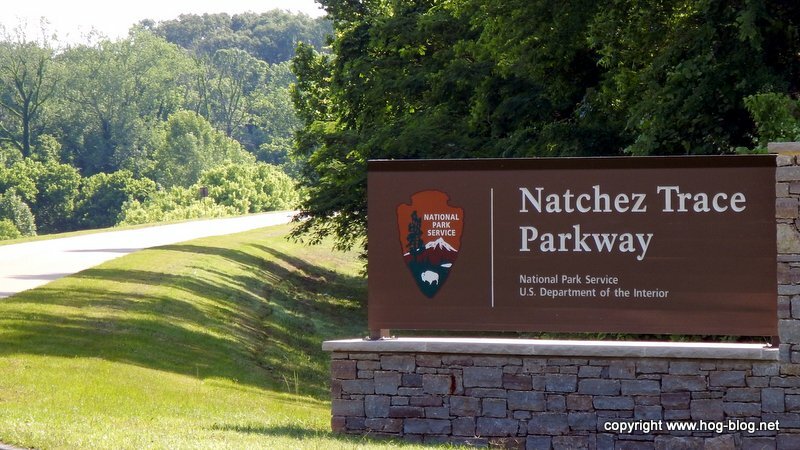 From there we followed the .5 mile nature path back to the visitor center. We then took time to watch the short video of Bandelier NM at the center before catching the shuttle back to our bikes. 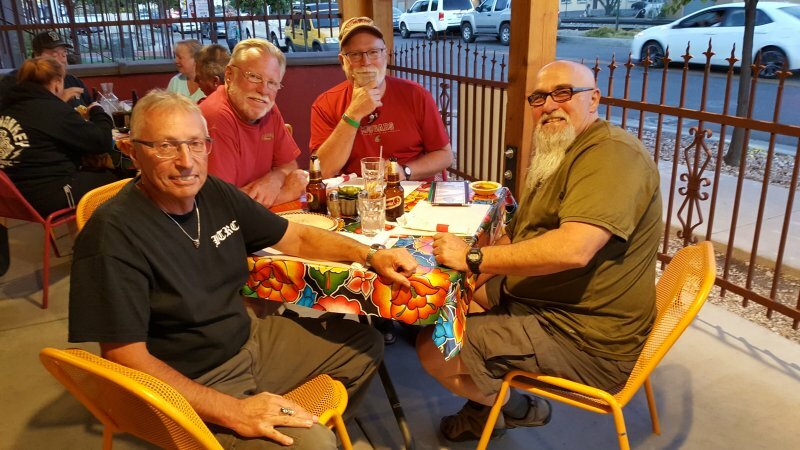 After Bandelier we stopped for dinner at Gabriel’s restaurant on the way to Santa Fe. Although Gabriel’s came highly recommended, it appeared to be a run down shack according to Google Map. On arrival, we happily discovered it’s an excellent restaurant on the outskirts of Santa Fe. The outside belies the comfortable and up-scale accommodations inside. Gabriel’s provides great service and an excellent menu of Mexican food. Our plan was to camp at the KOA in Sana Fe. The sun was setting as we approached Santa Fe. It was dark by the time we we reached the KOA. As we rode in thunder and lightening was active just over the hills from us. It started to sprinkle as we setup camp. It became a down pour as we slept. At one point we were all awakened to a tremendous thunderclap over our heads which felt like it bounced us off the ground. I came out of a deep sleep thinking I was back on the ship in Vietnam and that we had been hit. We generally survived the night without damage although Steve’s old tent leaked like a sieve and got his clothes and riding gear wet. After showering and drying tents and rain flys Steve recommended we visit the Palace of the Governors at the plaza. On the way we stopped at Harry’s Roadhouse Cafe (of Food Network fame) for breakfast. It’s a quirky little place. It’s also a favorite with locals and tourists with a creative menu of great food. 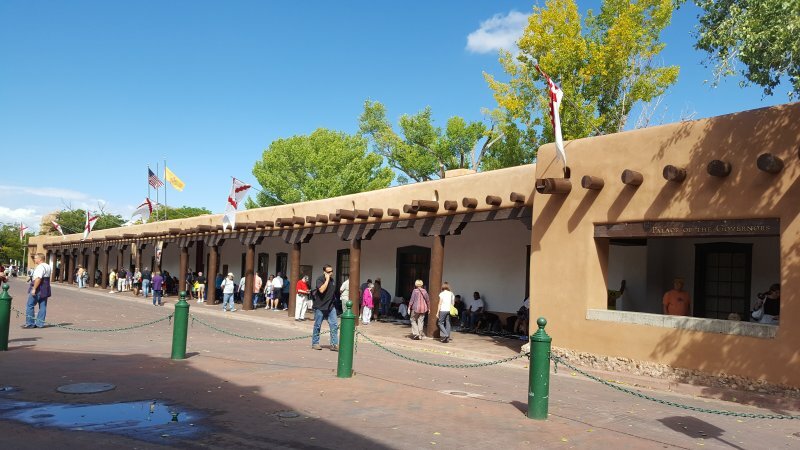 Steve once described the area surrounding the plaza is a little “Hoity-toity.” It was, though the palace itself was full of southwestern history. I enjoyed reading more regarding the Pueblo Revolt. Although adeptly described by Ramon, our guide at the Taos Pueblo, the palace provided photos and more detail. Outside you have the opportunity to purchase Native American crafts. Steve and I both purchased stone polished pottery from Laverne Loretto-Tosa. All the crafts people were friendly, but she was especially so. She even shared photos of her grandson making clay pots and the firing process. Steve found a jewelry artist and looking at his money clips. They had several Harley Davidson money clips. Steve commented to the guy, “They look good but you should make Native American stuff.” The artist responded with a rye smile, “It is Native American.” We both caught on and laughed. Steve bought a couple of money clips and they shook hands. As we started to walk away Steve said to the seller, “You didn’t shake my buddy’s hand.” The artist sardonically responded with, “He didn’t buy anything.” We laughed again. The night before left on this trip my step-son told me we needed to visit Madrid in New Mexico. It’s an old mining town and he highly recommended the burgers at Mine Shaft Tavern. Madrid sounded familiar so I looked it up on the web and discovered it’s the town where the Del Fuegos caught up with the Wild Hogs in the movie Wild Hogs. 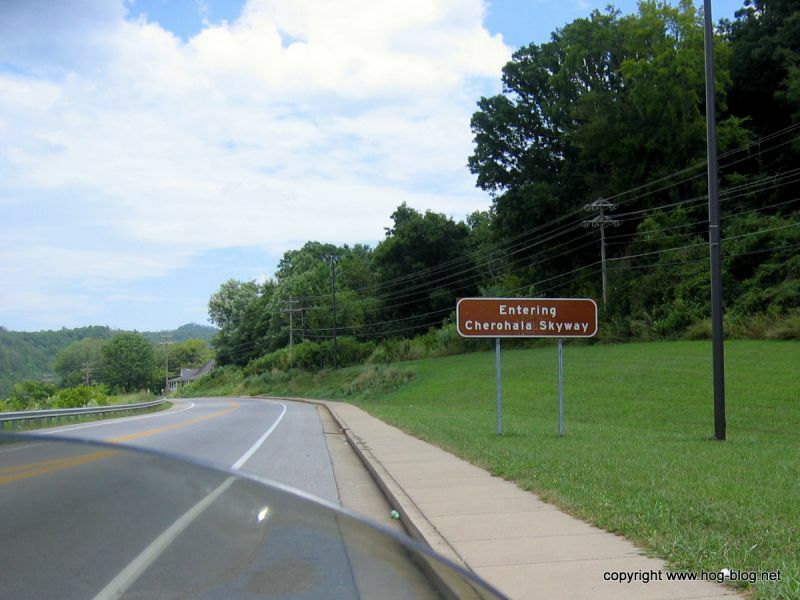 I added it to the itinerary on the ride to Heber portion of the trip.. So, our way to Albuquerque we took NM-14 to Madrid. 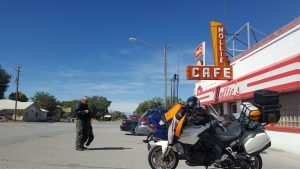 We visited Mollie’s Cafe from the movie (which is souvenir shop and ate at the Mine Shaft Tavern. The hatch chili burger was excellent. We spent the night at the KOA in Albuquerque with dinner at Sadie’s. Sadie’s is another great place for Mexican food. From Albuquerque we headed south to Socorro. 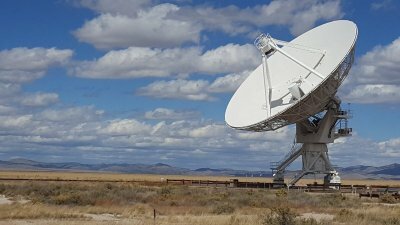 We then took a right on US-60 to the National Radio Astronomy Observatory (NRAO) Very Large Array (VLA). These are the antennas seen in the 1997 movie Contact and Carl Sagan’s 1980 documentary, Cosmos. I had visited the site before, but Tom and Steve had not. It is a worth while stop/ It only takes about an hour to watch the video, view the displays and do a self tour. The video shows how the array is focused and the 82 foot diameter/280 ton antennas are moved and how the VLA is used. It’s an amazing place. We did the self guided tour. Of particular interest was the Jack of Diamonds, an up close visit to an antenna and a view from the balcony of the main building for a view of the complete array. I had visited the Pie Lady (Kathy Knapp) at Pie-o-neer Cafe in Pie Town the previous year. I decided our ride to Heber should include the home made Pies found at here. Plus everyone is friendly and it’s a heart (and taste bud) warming stop. The most interesting part of a visit though, is talking with the Pie Lady. We requested she come to our table for a photo, which she did. She then spent a half hour with us telling the history of Pie Town and her mother’s migration from Texas to Pie Town. At the time, no one was making pies in Pie town. Her mother insisted they purchase one of the cafes and start. Check out their web page for videos and history. 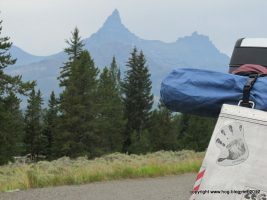 We had planned to meet friends, Andy and Cayla, at Hannagan Meadow Lodge on US-191 (The Devil’s Highway). When Steve called to reserve rooms he was told a wedding party had taken all but one room. So, I called Andy and he suggested we meet at friends Don and Judy’s cabin in Heber that night. Then, the next morning, ride together to Scottsdale on US-60 through Salt River Canyon. We met at the Red Onion Lounge where we had dinner and drinks. It was late so we quickly adjourned to Don and Judy’s cabin in the woods above Heber. It’s a great cabin. Although it was cold outside we were warm and toasty inside by the gas fire place. No tents that night. After an amazing ride on US-550 the day before we were treated with more great roads on our motorcycle ride to Taos. These were US-160 from Durango to Pagosa Springs then US-64/84 south heading to Taos. There were lots of short sweepers through the mountains and good pavement on the two laners. We visited Chimney Rock National Monument between Durango and Pagosa Springs, the Earthship Community and the Rio Grande Gorge Bridge. The latter two were just a few miles outside Taos on US-64. Since we had lost a day with our day late start from home I had decided we would skip the Taos Loop to make up a day. But, Steve suggested we still visit the Taos Pueblo, which had been scheduled for the Taos Loop. 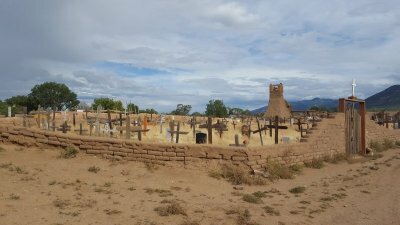 So, that morning we rode to the Taos Pueblo. 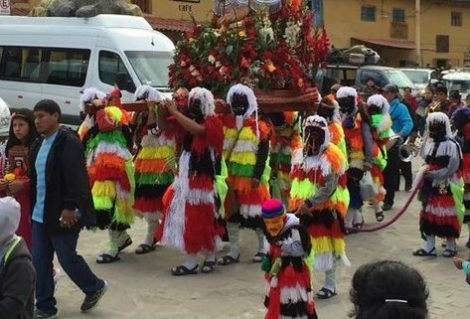 The Pueblo is a UNESCO World Heritage site which has been inhabited continuously for over 1000 years. You can do a self tour or a guided tour. We were glad we paid for the guided tour. Ramon, our guide, was knowledgeable regarding the history of the Pueblo itself and the Puebloan culture in New Mexico in general. He stories and descriptions of the history were captivating. The most interesting topic shared by Ramon was the Puebloan uprising of 1680. Due to the brutality of the Spanish most of the Pueblo people in present day New Mexico revolted and drove the Spanish back to Texas. We headed to Santa Fe after the Pueblo tour. 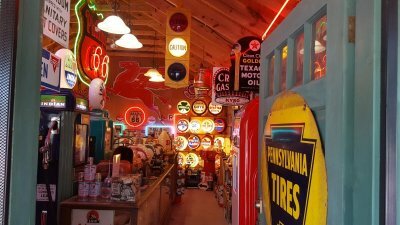 On the way we stopped in Embudo, NM to visit the Classical Gas Museum. It is well worth the stop. 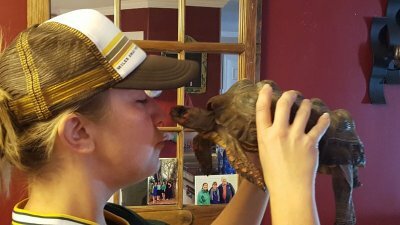 See the featured photo above and check out the photo gallery below for more photos. It’s an incredible experience. Bandelier National Monument was our next post and the subject of the next post. The first leg of our fall trek would be a motorcycle ride to Durango, CO. Two main goals were to visit the Colorado National Monument near Fruita/Grand Junction, CO and ride US-550 from Montrose to Durango, CO. We would also make other stops along the way to visit an old Navy buddy in Salt Lake City, and some of our favorite and new restaurants. We started a day late. We’re all getting older and one of our group had to get an MRI on the original departure day. He didn’t even wait for the results. I guess when you get older you don’t let small things like health stop you from continuing with your life and search for fun. All went well the first day. 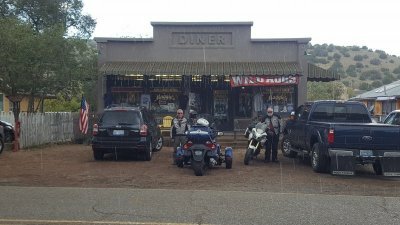 We stopped at one of our favorite cafes for breakfast: the North Powder Cafe in North Power, OR. Great service and food. Our day ended in Mountain Home, ID where we spent the night at the Gem State RV/Campground (formerly a KOA). 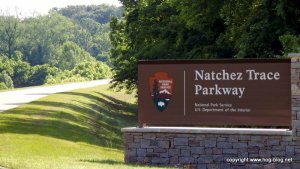 If you’ve been following this blog you’ll know that Norm and I started camping here in 2005 and traditionally stop here and stayed in site #13 on our way east. The next day, things didn’t go as planned. We stopped in Snowville for possible gas and lunch at Mollie’s Cafe (another favorite). The food was good and the waitress was friendly. We all missed one important thing regarding our mileage. we had been traveling 80+ mph on I-84. So, a long story short, Tom ran out of gas 5 miles before Tremonton. That was fixed by Steve who rode to Tremonton, purchased a 2 gallon gas can, filled it with gas and got gas for his bike. We arrived in Salt Lake City and hooked up with Vic, one of my old Navy buddies. He came prepared with a cooler full of Bohemians which we enjoyed pool side at the motel. Later we had dinner at the Red Iguana 2 which is one of my favorite restaurants in Salt Lake City. 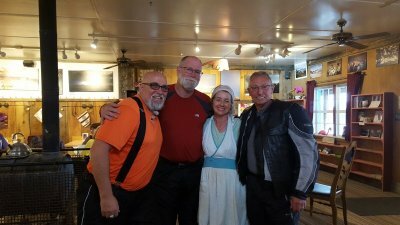 The Next morning we headed south on I-84 to Spanish Fork where we caught UT-6 to to Green River where we had lunch at the Tamarisk Restaurant. Good food and service again. We ended the day in Fruita, CO where we camped at the Colorado River State Park for the night. It was another blue sky day the next morning. 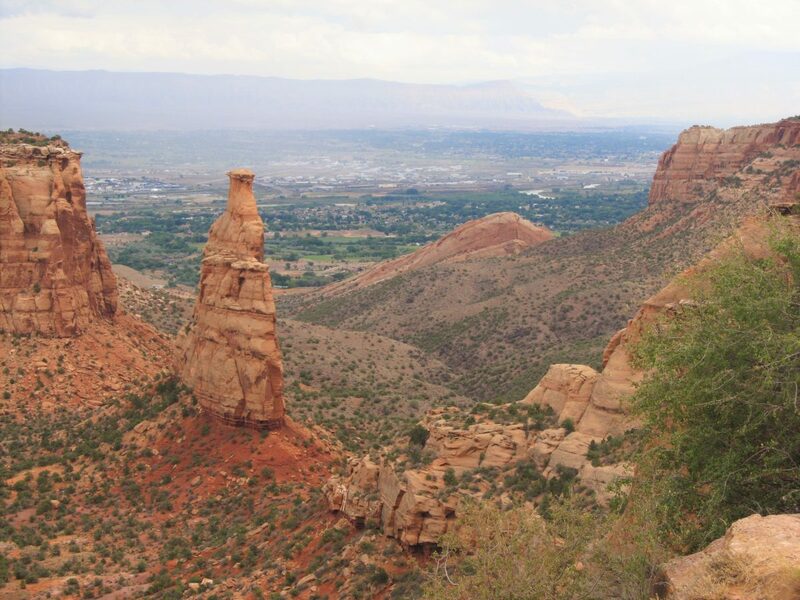 We packed and headed to the Colorado National Monument, about 2.1 miles from the campgrounds. The monument is an awesome experience. We hiked a few of the short trails and stopped at most of the overlooks in the park. We exited the park at the east gate and stopped for lunch and gas in Grand Junction. The best part of the day was our ride on US-550 (The Million Dollar Highway) from Quray to Durango (see featured photo at top and photo gallery link below). We stopped for the night in Durango, camping at the Durango KOA. 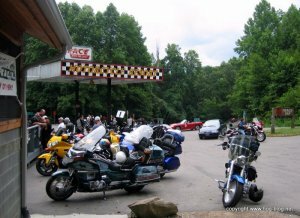 About.com has listed the 15 best motorcycle roads in America. As with all lists of this nature, I doubt anyone would agree that this is a conclusive list or in the correct order. Regardless, in my experience, it’s a good list. #5: Rte 1 in California, #4: US 550 “The Million Dollar Highway” in Colorado, #3: US-129 “Tail of the Dragon” in N. Carolina, #2: Blue Ridge Parkway in Virginia, and #1: Bear-Tooth Highway Montana-Wyoming (photo above left is Bear-Tooth Mountain). A group of my buddies plan to ride #8 California Rte 36 this fall. I will now try to work in #10: CA-2 “Angeles Crest Highway” and maybe #8 CA-36 to the coming fall ride. The route to Machu Picchu is not straight forward. For us, it involved motorcycle, train and bus rides. 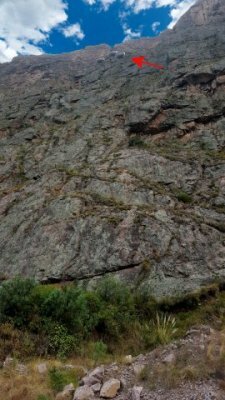 We rode to Ollantaytambo via motorcycles. 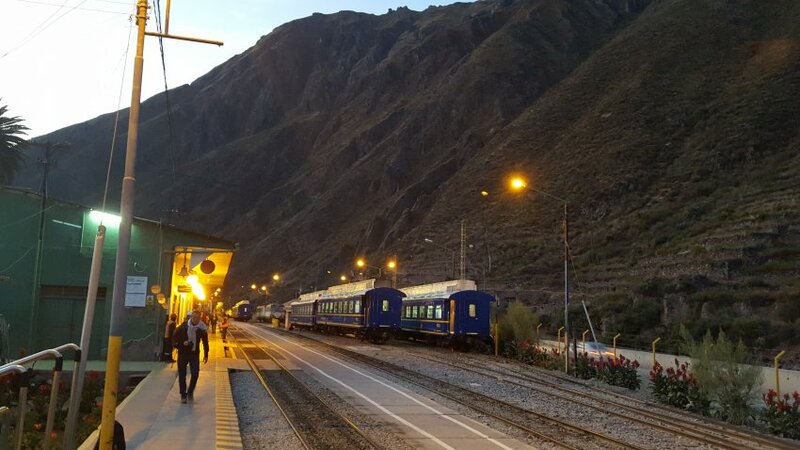 The next morning we took the 0630 shuttle train to Aquas Calientes (about 1.5 hours). There we took the shuttle bus up to Machu Picchu (about 30 minutes). The train ride was comfortable and scenic. The “Road of Death,” not so much.